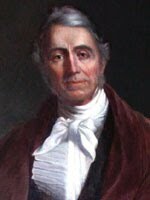 Marcus Morton was an American lawyer, jurist, and politician from Taunton, Massachusetts. He served two terms as Governor of Massachusetts and several months as Acting Governor following the death in 1825 of William Eustis. He served for 15 years as an Associate Justice of the Massachusetts Supreme Judicial Court, all the while running unsuccessfully as a Democrat for governor. He finally won the 1839 election, acquiring exactly the number of votes required for a majority win over Edward Everett. After losing the 1840 and 1841 elections, he and was reelected in another narrow victory in 1842. The Massachusetts Democratic Party was highly factionalized, which contributed to Morton's long string of defeats. His brief periods of ascendancy, however, resulted in no substantive Democratic-supported reforms, since the dominant Whigs reversed most of the changes enacted during his terms. An opponent of the extension of slavery, he split with longtime friend John C. Calhoun over that issue, and eventually left the party for the Free Soil movement. He was considered by Martin Van Buren as a potential vice presidential running mate in 1848.